I’ve been watching a lot of Viking TV lately (Norsemen and Vikings FTW) and have been enthralled by the raid culture they lived. And so, when a game all about Viking raids is announced, you better believe I’m interested. 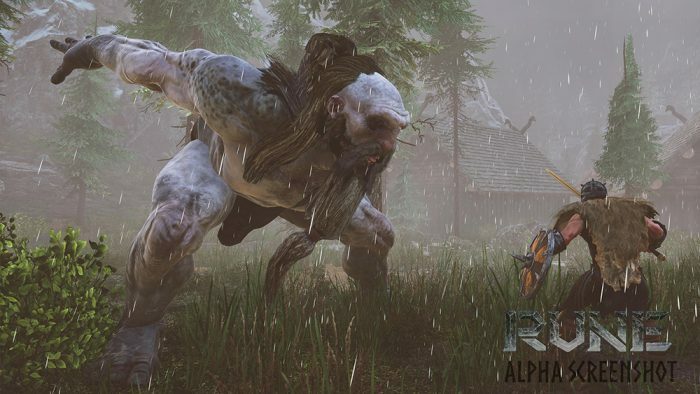 Rune: Ragnarok, set during those golden raiding times, is a multiplayer/single player hybrid, mixing PvP and PvE (depending on which server) and RPG elements (it can be played alone as well, if you’re up for it). Developed by Human Head Studios, it’s the spiritual successor to the original Rune, from way back in 2000 or so. 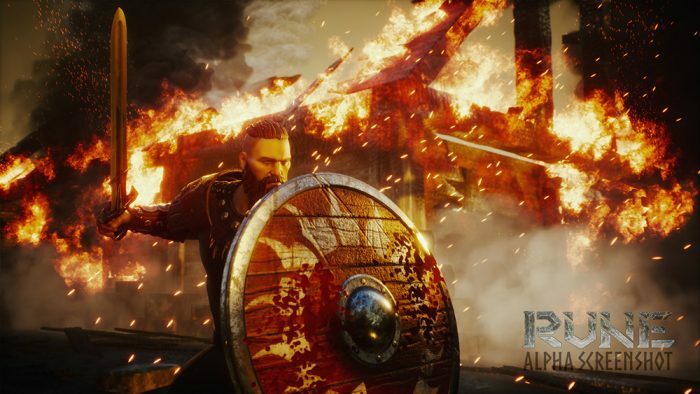 The Alpha build of the game (demoed at E3) is designed to show us some of those elements, especially focusing on the combat mechanisms. The gods are mad, so our collective goal is to prevent them from completing Ragnarok, the end of the world. The map is substantial, consisting of several islands, mountains and towns. The design of the world is varied enough that we can gauge landmarks as our guideposts instead of relying on the in-game map, and with a lot of verticality it’s not all that possible to get lost. Every so often a hill or peak will present itself to us to climb up and grab a new vantage point. Our initial task is to light up specific quest stons scattered throughout the world that will reveal the god Loki’s location. The first is directly in front of us when we initially spawn in the build, and tells us that we need to reach another specific point on the map to kill a couple of humans. Though the world is large, there are plenty of things to do along the way, with waypoints and markers popping up all the time. These activate sidequests that let us gain loot, which we can hoard like actual Vikings (probably) did. We have a few inventory slots for weapons, tools, crafting materials and actual power-giving runes themselves. The melee and ranged weapons have a unique abilities — hammers knock people back, swords have mid range and speed, spears have long range but are slower, and bows and bombs make distance attacks even more viable. When we attack enemies, we can actually chop off limbs and use those pieces as weapons. The enemies don’t die right away, either, so there’s nothing more satisfying than hacking off the leg of a draugr and beating him with it as he tries to crawl towards us. We can even throw weapons by hitting the Q button and toggling in the mode, so chucking things like spears at people lets them stick in place in enemies as they are running around. The attacks are motion based, so if we strafe right then the swing of an axe will be different than if we’re pushing forward or jumping. Furthermore, skills open up that can improve us further, and even allow us to learn recipes for crafting tools, defense and transport. This can open up a pretty substantial variety of ways to approach the game. Completing a quest or sidequest notifies our assigned god, who will drop a treasure chest in front of us filled with weapons and materials. It also gives us experience points, which bring up our level and make us stronger or add health points. The disparity in the build between player and enemy is bigger than just one level number, as Level 5 giants easily defeat my Level 4 character with one hit. I need to rely more on strategy, so the long range attacks work best to weaken the dudes, letting me run up, take a couple swipes and run back. The game has a generous respawn mechanic, wherein dying lets us choose which point we come back to life at, if we’ve found one. Each major island has at least one of these waypoints, so we (hopefully) don’t have to go far to get back our dropped loot or to our team. If we don’t find one, however, then it results in one of the developers needing to die as well to get back to me. Sorry! Whoops! I can see this possibly being an issue in the final game, especially if we take our team on a boat to an island, die, and need to find our way back (or build another boat). This happens to me a lot, but thankfully the devs have placed some pre-made boats all over the place. Getting back to my death location doesn’t take long, and I’m right back in the thick of beating up a giant. Until, of course, Loki becomes aware of our efforts and starts dropping lightning bolts down on us. These can seemingly happen at random, and almost unfairly at that, requiring us to essentially drop everything we’re doing and run for cover. The dev team is trying to optimize the game for 64 players at once, with 30 currently working comfortably. The battle for activating the quest stones, grabbing loot, attacking monsters and towns for experience points and quests could get extremely heated. This is definitely a team game, and bigger teams may be beneficial, especially in modes where we can cause harm to each other. 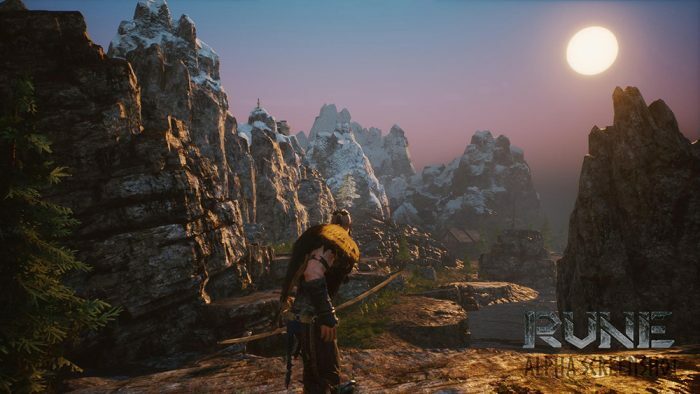 Rune: Ragnarok seems like it could be an interesting concept for multiplayer, once enough of the bugs are worked out and content is added for things to do around the map besides killing giants or raiders. It feels like a narrative plot pulling everything together is going to be a part of the experience (at least, it may be needed), as well as customization and exploration, deep crafting and combat. The game launches in Early Access later this year, and a Beta is planned for later in June.